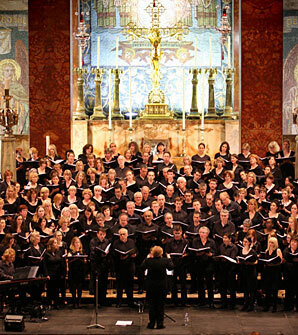 The West London Choir is a non-auditioning community choir led by musical powerhouse, MJ Paranzino, the multi-talented singer/songwriter and musical director. MJ believes that singing is a joyous and mutually uplifting experience for both audience and performer - and good for your health too! The choir is involved in community outreach, performing new choral pieces and an established repertoire, as well as at weddings and other traditional celebrations. Every year, MJ asks composers from all musical genres to write new choral works to a specific theme. 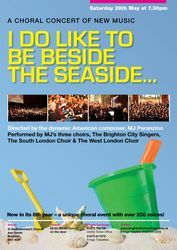 For 2011, the theme was I Do Like To Be Beside the Seaside, and on May 28, for the second year running, MJ’s Choirs (including The West London Choir) with 200 adult voices in total, performed five new pieces in the beautiful St Bartholomew’s Church. It was a fantastic evening, followed by a rollicking after-show party. Go to the choir’s Facebook page for photographs of the event. 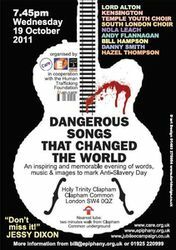 In October and November 2010, The South London Choir were joined by The West London Choir, The Brighton City Singers, and children from local primary schools, in organising two charity concerts to raise funds and aid for the flood victims of Pakistan. Accompanying the choral pieces (sung by over 200 adult voices), there were electric performances from Pakistani musicians and dancers, delicious authentic Pakistani food along with cakes, pies and cupcakes to eat, with jams, jellies and chutney all made by the community to raise funds. There were guest speakers who enlightened the audience on the arts, culture and history of the country, as well as poetry readings from the school children that they wrote themselves. Check out both the choir and childrens' performances on YouTube. The concerts raised over £5500, which was donated to Pakistan Human Development Fund UK and food and aid have been sent on our behalf to the affected areas. 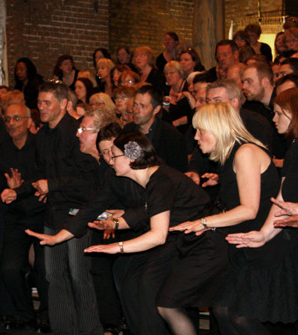 On May 1st 2010, as part of the Brighton Fringe, The West London Choir were joined by MJ’s two other choirs, The Brighton City Singers, and the The South London Choir in a 200 strong chorale of new music titled ‘Walls of Sound’, arranged and directed by MJ herself. The concert was held at the beautiful St Bartholomew’s Church in Brighton, to a full house and enthusiastic audience.